Brigadier General (Ret) Russ Howard articulates the need for SOF to develop language and cultural skills capabilities that reflect the wider range of locales and ethnic groups in which SOF engage while carrying out their diverse missions. General Howard outlines various definitions of culture and highlights the relationship between cultural understanding and the ability to predict behavior on the ground--an invaluable asset for a SOF operator. Drawing on his experience leading the Special Forces Language School, General Howard explores the relationship between learning a language and culture, highlighting the implications for SOF. As USSOCOM and SOF rebalance the force for a posture of persistent presence in complex operating environments, this monograph is an important contribution to the discussion of how language and cultural skills capabilities should be defined, prioritized, and developed. Dr. Roby Barrett’s examination and study of some 200 years of the Sultanate of Oman’s dynastic history puts into context the last four decades of the Sultanate’s history. It answers the question of whether Oman has changed fundamentally from a nation fraught with instability and conflict to one of peace and stability. 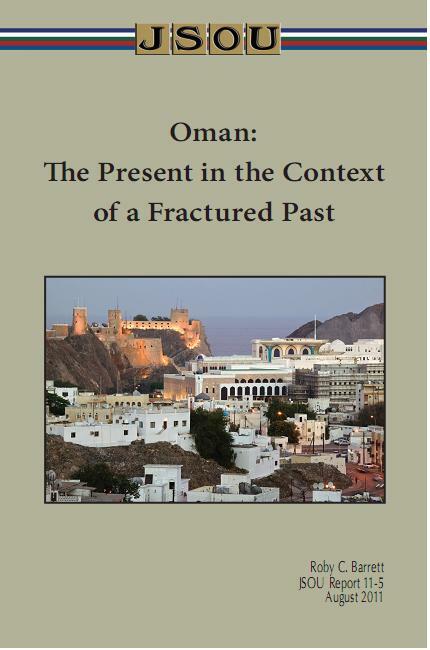 Barrett’s analysis of modern-day Oman will help the reader avoid the pitfalls of misinterpreting the present condition on the basis of Oman’s largely tumultuous past, which often featured conflict and competition for wealth and power. Dr. Barrett’s most recent monographs, this work on Oman and his earlier study Yemen: A Different Political Paradigm in Context, are bookends that will provide the SOF reader with a deep understanding of the present and historical context which has resulted in the southern Arabian region of today. Each year, JSOU partners with the Special Operations and Low Intensity Conflict (SO/LIC) Chapter of the National Defense Industrial Association (NDIA) in sponsoring the annual chapter essay contest. The first-place winner is recognized each year at the NDIA SO/LIC Symposium held in mid-February and awarded a $1,000 cash prize. The runner-up receives a $500 prize. The competition is open to resident and nonresident students attending Professional Military Education (PME) institutions and has produced outstanding works on special operations issues. These essays provide current insights on what our PME students see as priority national security issues affecting special operations. JSOU is pleased to offer this selection of the top five essays from the 2011 contest. The JSOU intent is that this compendium will benefit the reader professionally and encourage future PME students to write on special operations issues. 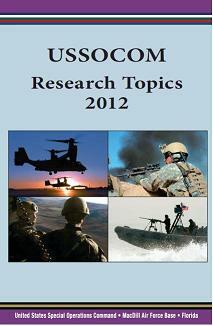 The USSOCOM 2012 Research Topics list is intended to guide research projects for PME students, JSOU faculty, research fellows, and others writing about special operations during this academic year. Research is one of the cornerstones of JSOU’s academic mission as we strive to produce publications to meet joint SOF operational and planning needs. Each year representatives from USSOCOM, the Theater Special Operations Commands (TSOCs), SOF chairs from the war colleges, and JSOU senior fellows develop a list of salient issues confronting SOF in the near term. The list is vetted through the components and TSOCs to ensure that research will advance SOF missions and support SOF interests. The final recommendations for research topics are approved by the USSOCOM commander. Ultimately, the research, study, and debate of these topics will inform decision makers and better prepare SOF for our current conflicts and future challenges. In this sweeping study of Yemen, Dr. Barrett argues that while Yemen may be a failed state, it is not a failed society. Yemen is a complex society with power built on family, clan, and tribal relationships. It is not one nation-state, but rather a balance of multiple Yemens based on fundamental social, cultural, and sectarian differences. Within this context Dr. Barrett asserts that now is the time to reconsider U.S. approaches towards Yemen. We should not seek governmental transformation, but rather strive to reach beyond the central government and weak institutions to engage tribes and clans. Throughout history, political power has ebbed and flowed between central and decentralized local and regional authority. Yemen today is no more or less fragmented than it has ever been. Our goal should be to strive to achieve a balance among these multiple Yemens--groups that have coexisted, almost in continuous conflict, throughout history. As the director of the United States Special Operations Command (USSOCOM) Interagency Task Force (IATF), Mr. Frankie Shoyer introduces this Second Edition. This edition enhances the earlier document by adding President Obama’s National Security Strategy, expanding information in other areas such as in the Country Team and discussing the concept of the SOF professional operating as the 3-D warrior (defense, diplomacy, and development). This concept recognizes the importance of SOF as part of the sinew that binds together critical elements of national power and animates them under the most demanding conditions. As USSOCOM conducts a robust engagement campaign working with U.S. Government interagency components, the manual serves as an essential component of USSOCOM/JSOU’s successful education curriculum that is focused on the interagency process. 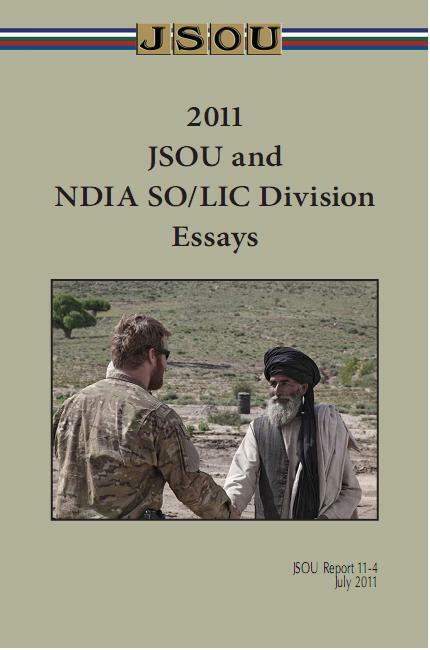 JSOU’s Interagency Education Program and this manual make important contributions to the knowledge base and professional development of the SOF and interagency communities. The 6th Annual Sovereign Challenge Conference featured 103 Foreign Defense and Military Attachés, Law Enforcement Attachés, and Diplomats representing 67 countries. The conference theme was Borders & Security: Similarities, Differences, and Shared Affinities. This conference explored a wide range of topics to include border control/management, trust, corruption/transnational crime, development of public support for education, a whole-of-government/whole-of-nation approach, and dealing with the unique challenges a border “ecosystem” presents. The concept of an ecosystem captures the complex dynamics whereby permanent residents and stakeholders of a border region increasingly interact with flows of humans, goods, information, cash, and other commodities. The degrees of permeability along any given border are best managed by information exchanges, policy coordination, and operational collaboration among all affected nations. The author of this paper--an experienced and highly regarded terrorism specialist--provides a learned narrative about the scholarship and doctrine concerning terrorism and insurgency. The premise of the paper is that terrorism in the 21st century has become predominately international in nature, riding on the back of opportunities provided by new technologies in cyberspace, aerospace, and the Internet. In offering his thoughts about the well-chronicled flow of terrorism analysis, Dr. Sloan identifies how such recent trends should be affecting counterterrorism doctrine and policy. He suggests that traditional concepts for countering terrorism and insurgency are not effective in dealing with contemporary terrorism in its modern form as a non-territorially based insurgency. In the concluding parts of this monograph, Dr. Sloan addresses a number of additional views for improving upon the traditional approaches in order to deal with international and virtual threats, including a need to be keenly focused upon countermeasures for terrorist’s use of aerospace and cyberspace. In this two-part work, Dr. Turnley addresses first the relationship between cultural competency and language, closing the first section with a look at how cross-cultural competency is measured and assessed. The discussion addresses the ability to operate cross-culturally--long been touted as one of the hallmarks of SOF general and Army Special Forces (SF) in particular--and explores if and how the various service special operations components select and assess candidates for their ability to operate cross-culturally. Among other things, this will consider the unequal distribution of this competency across the SOF service components. The second part of this monograph addresses current interest in developing and transmitting knowledge about human terrain within the Department of Defense. As culture and its importance as a component of successful warfighting has risen significantly, the defense community as a whole has embraced the tenants of irregular warfare. This section further addresses whether there is a difference between the ways in which the General Purpose Force (GPF) and SOF develop and use cultural knowledge and considers whether an increased focus on irregular warfare forced GPF to adopt a skill set long at work within SOF, or if SOF retain either a special type of knowledge or a special way to apply knowledge more broadly held. Some 70 years ago the OSS came into being as a small, nearly invisible, Washington, D.C.-based organization whose unique capabilities and strategic reach resulted in decisive outcomes during World War II. Today the OSS legacy survives as a practical touchstone for the SOF Warriors of the 21st century. 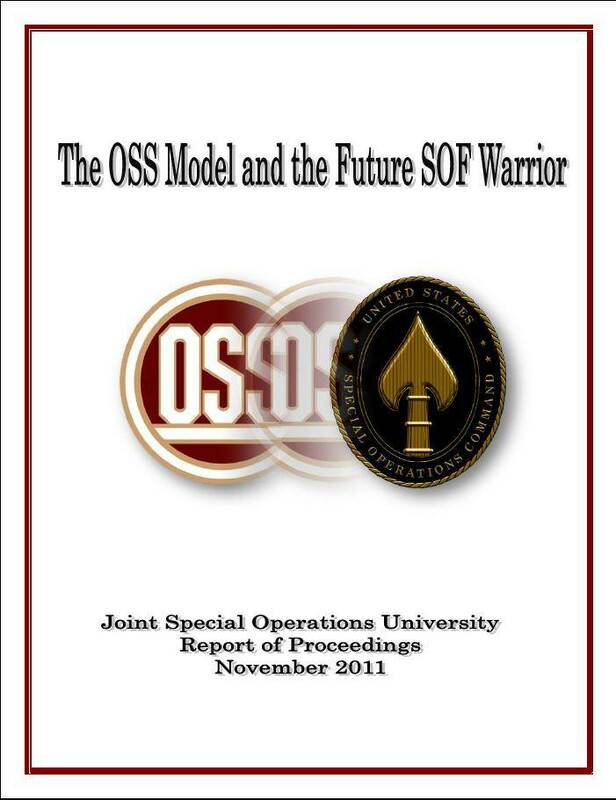 As part of the USSOCOM Commander‘s Guidance for 2011, JSOU was directed to complete a study that addressed if and how the OSS Model could be used to improve USSOCOM efforts to select, organize, resource, and develop authorities for SOF of the future. JSOU engaged select experts from the SOF community, academia, and the OSS Society to assist in developing recommendations for the Commander’s review. This report, organized by issue, highlights the group’s recommendations. The JSOU Strategic Studies Department convened a SOF-Power Workshop in August 2011 to examine the role of military Special Operations (SOF-Power) in national security and the relevance and feasibility of a theory of Special Operations to inform and guide the development and use of Special Operations and SOF. The workshop participants critically examined the role of military Special Operations in the 21st century, validating SOF-Power‘s continued strategic utility. From this foundation, the participants concluded the need for a unified theory of Special Operations as a foundational document for the pursuit of education and strategic art within the SOF community, and the greater military and political communities. This report documents the group‘s insights and conclusions and provides recommendations for a way forward in broadening the strategic art in regard to SOF-Power.